This topic contains 17 replies, has 4 voices, and was last updated by Paul 8 months, 3 weeks ago. I’ve been searching for themes appropriate for a photography site for days and I find the Bild theme the most appealing! I’d just like to get a couple of answers before I purchase it. I am wondering if this is possible to create with the theme as it is, or do I need plug-ins, or do I need extra coding? I would also like the gallery/portfolio pictures to be clickable but without the half-transparent layer and typography appearing on it. Is that possible? In a word: you can have a front page just like Renato Rampolla without any additional plugins or coding. 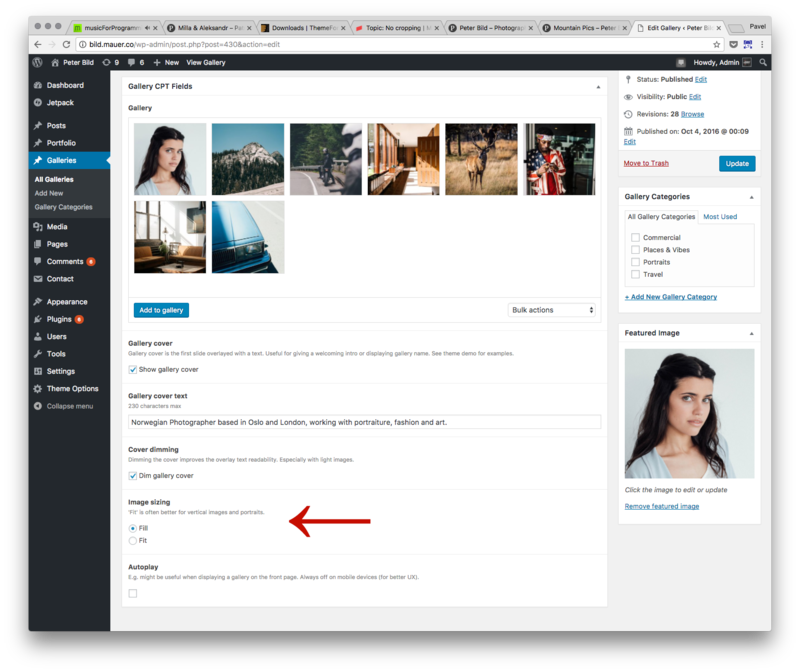 What Renato uses is called a ‘gallery’ custom post type in the context of this theme. Images can fit (example) or fill (example) a gallery. Please mind though that if you want to use the ‘project’ custom post type, it will always crop your images for thumbs (example) and show uncropped images in a lightbox once you click an image. As for removing the half transparent layer and project names over it, this can be done with a few lines of CSS that I can provide here on the forum (at no cost) and you can just paste them with a plugin. If you buy the theme, I highly recommend that you follow the setup instructions in the User Guide and import the demo content. This will make figuring out how to use the theme much easier. It’s great to know you found the Bild theme stand out from the crowd. I really appreciate that. Thanks for your help! I’m so slow but I’m finally ready to update my homepage and buy your theme. I’m curious about the support option though. I’m offered 12 months of support instead of the 6 months included for an extra 15 $. But it seems we get free support from you here anyways? Is it necessary to buy those extra months? Does that really money go to you or to Envato Market..? As for support, yes, usually I’m providing support regardless of whether a user has a plan running or not (and some people obviously sort of take advantage of it). That’s just because I didn’t setup a check for that, always being busy with other stuff. The support money on TF goes to authors (minus a comission that goes to TF). Thanks. Be sure to start with the User Guide* that comes with the theme. And if you have any questions, I’m always ready to help here. Cheers! Go to https://themeforest.net/downloads. Find the theme and click ‘Download’ > ‘All files & documentation’. Download and unpack the zip file. The User Guide will be in the ‘Documentation’ folder. You replied that it is possible with an additional few lines of CSS which you could provide. I will have four gallery categories and it’s only in one of them – photography – in which I will have some untitled singles and would like to skip the half-transparent layer and typography (to mark that it is only this single image ant not a series if one clicks to view it big). So will it be possible for me to apply the code to remove the stuff from only a selected few of the images within the gallery category? Or must it be applied to all of them? It’s possible to remove the transparent overlay and the name of the gallery for selected gallery entries on the list. Do you want to remove them both when a certain gallery is selected and when all categories are being shown? I am interested in removing the text overlay on galleries as well (at least on mobiles). You can add the above code with the Simple Custom CSS plugin. Once you install and activate it, in your Admin Panel please go to ‘Appearance’ > ‘Custom CSS’. Insert the code you see above and save. Thank you Pauk, I just realized the email notification was in the spam folder. You are very welcome, Pietro. Thank you for using Bild. I’m exactly on the sam point and was wondering fi there is a possibility to no Crop the Image in the Project layout as it is possible in gallery. You answered already that not. Do you think it will be possible in the future ? I thing cropping in the moste cases kills the pictures ! when I was looking on your demo page, I was pretty sure that there the Pictures didn’t get cropped ?! I guess the answer may be they all are in square and 4:3 cropping only by 3:4 – way ? This reply was modified 9 months ago by steinmann. Actually, I plan on delivering uncropped images in one of the future updates. That would basically work the same way that it does here: http://stills.mauer.co/proj/a-skaters-paradise/ I hope to get this updated version on the market within 2-3 months. for sure I’ll tray the function if the update is out. Thank you for having chosen the theme for your website.